Actor Jiiva has been blessed with a baby boy we all know. The actor known for his friendliness and good rapport with his fans and public has sought suggestions to name his son. This, he has revealed, on a micro blogging site where he is a regular. First he sought everyone's blessings and now comes this news. We are sure that this actor will sure be a popular hero in coming years. Jiiva is currently in Delhi with his wife and child. 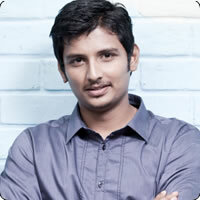 Jiiva and his wife were childhood friends and she hails from Delhi.